I annoy the crap out out my wife. She’ll tell you that. It’s not a secret. And to be fair, she annoys the crap out of me as well. We struggle like many couples do. In the midst of all the other roles we play our roles as husband and wife often get bumped to the end of the line. We love each other – but sometimes it ain’t easy. But I’m a lucky man. My wife is a talented singer and actress. Incredibly talented. And although she set those dreams aside when we moved back to Syracuse so many years ago she stays fresh by performing once a year or so in some local theater production. A couple of nights ago I saw her in The Redhouse Arts Center’s production of Ragtime. It’s a powerful show and a great production. It’s one of the best shows I’ve ever seen on a stage here in Syracuse. And my wife rocks. She’s a versatile performer. Over the years, she’s played lots of comedic roles. She’s got a great knack for comedy. I’ve enjoyed every one of them. But occasionally – a handful of times over the past decade or so – she’s tackled roles with some grit. 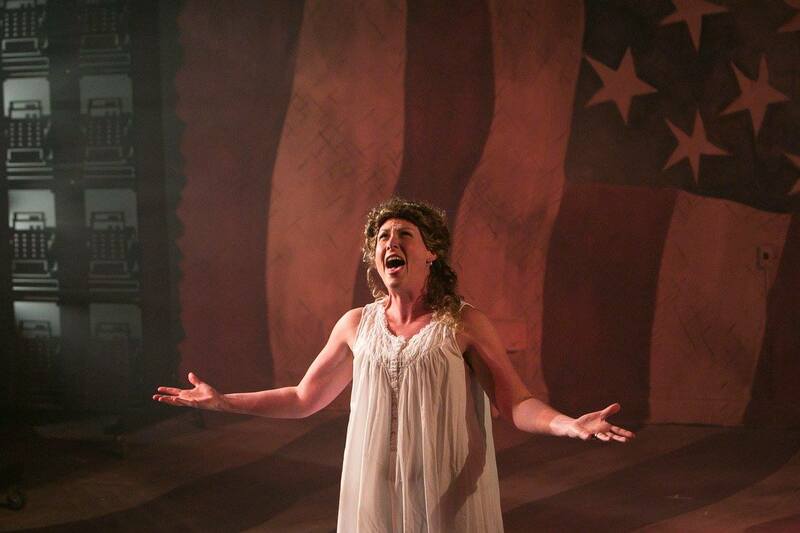 James Joyce’s The Dead, Grey Gardens… and now, at The Redhouse, in the role of Mother in Ragtime, my wife has again shown the depths of her talent. She brought me to tears. I’m a lucky man. Sitting in the theater the other night, watching her own the stage, I was reminded of the amazing woman with whom I am blessed to share a life. I’m twice-lucky, in fact. I’m married to an amazing woman. And, every once in awhile, I get to see the self-actualized person she is when she’s performing. In contrast to those everyday moments when the dog has puked on the carpet, one of the kids is throwing a tantrum, or husband and wife are in the midst of a Cold War over some bit of household conflict (“sure, I’ll keep walking around this basket of laundry…”), I’m lucky enough to see her transcend her mundane roles as wife, mother, daughter/daughter-in-law, small business owner. I get to see her shine. I am humbled by her talent. I’m amazed at her ability. I’m grateful for the opportunity to see her in a light that we never see at home. I’m struck by the reminder that this woman is so much more than the person I too-frequently look past in the daily rush of our busy lives. Those moments remind me of the wonderful, complex, capable woman with whom I fell in love and, incredibly, am loved by in return.